The average Hourly wage for Non-Management private sector workers in Sept 2015 was $20.67, 2.3% higher year-over- year. In the 70’s and 80’s wages increased at an annual rate of 8%-9% a year, making an increase of 2.3% seem almost laughable in comparison. When we look at the weekly earnings of the average worker in the U.S. the picture at first glance, appears to be quite good. Since 1973, average weekly earnings have increased from $232 to $782 and that appears to be a big move in the right direction. However, when you factor, ugly old inflation into the equation the outlook changes and real average weekly wages have hardly budged since 1980. Yet everything else has, it costs more to go to college, more to buy food, more for gas (despite the drop in oil prices), more to visit the doctor and significantly more to buy a house. 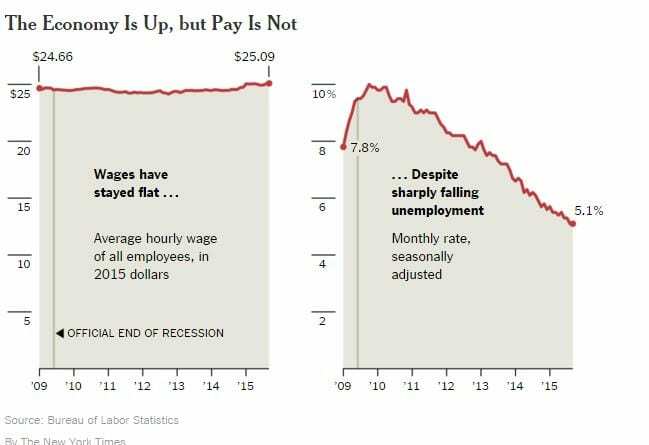 This chart below clearly illustrates how despite a low unemployment rate of 5%, real wages are actually dropping and not rising. Then we have other trends as noted by Peter Cappelli, a professor at Wharton School of Business. He states that many retailers base manager’s bonuses on whether they can keep labour costs below a certain level. 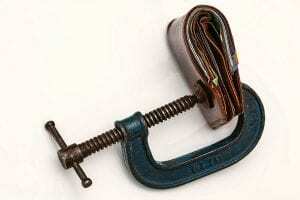 If these managers blow the budget ceiling they blow their bonuses away too. There is only one way to win this filthy game and that is for you take control of your finances. Do not trust Wall Street, Main Street or your government to take care of you. Learn how to use Mass Psychology to be on the right side of the markets and how to make sure you do rot in your Golden years.